We’d love your help. Let us know what’s wrong with this preview of Hell's Corner by David Baldacci. Wanneer een bom in het hart van Washington D.C. tot ontploffing komt, lijkt in eerste instantie alles te wijzen op een aanslag op de Britse premier. Op het moment dat de bom afging, verliet hij net per limousine het Witte Huis. De autoriteiten zijn er dan ook van overtuigd met een mislukte terroristische aanslag te maken te hebben. Om te helpen bij het onderzoek stuurt de Wanneer een bom in het hart van Washington D.C. tot ontploffing komt, lijkt in eerste instantie alles te wijzen op een aanslag op de Britse premier. Op het moment dat de bom afging, verliet hij net per limousine het Witte Huis. De autoriteiten zijn er dan ook van overtuigd met een mislukte terroristische aanslag te maken te hebben. Om te helpen bij het onderzoek stuurt de Britse geheime dienst binnen een dag een van haar beste agenten naar de Verenigde Staten: Mary Chapman. To ask other readers questions about Hell's Corner, please sign up. Is Hell's Corner the last of the Camel Club series? Janet Buck I hope you're right, Amy! I read most of Baldacci's series, but the Camel Club is my favorite. I hope this is not the end of The Camel Club. I'm invested in these characters and I want to know what is next for them. Hell's Corner begins with a bang. B.O.O.M. Literally! A stroll through Lafayette Park for Oliver Stone will prove to be more than a headache for him. A bomb has been detonated so close to the White House in spite of all the security surrounding the place. At first, it looks like a terrorist attack targetting the visiting British Prime Minister but after a while, it seems like there is so much more to this very carefully planned attack. Oliver Stone is pulled to help his government again. A new badge and a new partner is given to him. His new partner is Mary Chapman, an MI-6 agent. Yet, like always with Oliver Stone having his past as John Carr, so many other agencies are not happy with him. Oliver will need to watch his back and when he can trust his own government, he will enlist the help of his friends from the Camel Club to help him investigate the terrorist attack before another one happens. Hell's Corner was full of action, intrigue and killer suspense. One action, trigger multiple responses and it seemed like Oliver and Mary were always one step behind. They could trust no one but they both wanted the same thing: The truth. There were two great twists which I loved. The second twist was perfect. I do hope I get one more book so I can get some answers to the open-ended ones. If not Bon Voyage to Oliver, Annabelle, Mary, Harry, Reuben, Caleb, and Alex. Oh my David -- I long for the days gone by when you really dug deep for your clues -- and drove mystery and intrigue from carefully deposited hints and facts -- etc-- But this one seems so convenient-- Whatever you need --you just write it in-- without allowing us to find the foreshadowing you used to expertly weave into the storytelling-- that made them believable-- In this one although half of Washington lie dead in the path of Oliver-- The villain was not only impossible to imagine but her pa Oh my David -- I long for the days gone by when you really dug deep for your clues -- and drove mystery and intrigue from carefully deposited hints and facts -- etc-- But this one seems so convenient-- Whatever you need --you just write it in-- without allowing us to find the foreshadowing you used to expertly weave into the storytelling-- that made them believable-- In this one although half of Washington lie dead in the path of Oliver-- The villain was not only impossible to imagine but her payoff-- 1 billion dollars-- David did you think the novel was not going to press this decade--really David -- please get back to caring about what you write! Hell’s Corner is my first novel by one of the reigning American authors, David Baldacci. I decided to read his novels as I was trying to get out of my usual reading routine - and by “my usual routine” I mean, novels written by John Grisham and Sidney Sheldon. I was surprised that I am happy to get out habitual reading routine and tried Baldacci’s novel. And from this day forward, I’ll be collecting David Baldacci’s works. David Baldacci’s works include the famous novel (and his very first publish Hell’s Corner is my first novel by one of the reigning American authors, David Baldacci. I decided to read his novels as I was trying to get out of my usual reading routine - and by “my usual routine” I mean, novels written by John Grisham and Sidney Sheldon. I was surprised that I am happy to get out habitual reading routine and tried Baldacci’s novel. And from this day forward, I’ll be collecting David Baldacci’s works. David Baldacci’s works include the famous novel (and his very first published novel), Absolute Power, which according to some reviews in goodreads, it tells the story of a fictional American president and his Secret Service agents who are willing to commit murder in order to cover up the accidental death of a woman with whom the President was having an affair. The novel’s success became an absolute hit and was mas made into a film, titled Absolute Power in 1997 starring Clint Eastwood and Gene Hackman. In year 2005, he began with the Camel Club series where Hell’s Corner was one of its fifth (5th) books. To top it all, Camel Club is still a huge hit in 80 countries across America, and I am happy to experience that sensational hit. Hell’s Corner, is the fifth book from the series “Camel Club “(as also stated above). The story revolves around a resigned skilled assassin, Oliver Stone. Oliver Stone was forced to be back in his business when he experienced a bombing in a known park near the White House. He was given one mission, and that is to find those responsible for the bombing. As Oliver Stone and his company open the secrets behind the bombing, their opponents are becoming lethal and worst of all, it seems that the park bombing is just the enemies’ bait to cover up the scheme they have planned for centuries. With nowhere else to turn, Oliver Stone asked for the overpowering assistance from the four political watch-dogs, also known as, The Camel Club. Rating - 10/10(Masterpiece) - A web of complicated plots, love! After finishing up the fourth book in the series, I thought it was a good ending to the series. After seeing the fifth book, one would have raised a question - Why the hell would there be a fifth book? Well, I thought I would be disappointed. But to my surprise this book was fantastic and one of the must reads of this series even if the payoffs for the series was a little weak. The plot revolves around the bombing around the Lafayet Rating - 10/10(Masterpiece) - A web of complicated plots, love! The plot revolves around the bombing around the Lafayette Park at the time when British PM was paying the visit to POTUS. POTUS wanted Oliver to investigate this. Soon, this became a matter of national security, so Mary Chapman, an MI6 agent was brought in to be the partnered with Oliver Stone. The plot gets quickly gets complicated every revelation which contradicts each other. Oliver trust in Uncle Sam was declining. So, he asks The Camel Club for the favor. The members are - Oliver Stone, Reuben Rhodes, Caleb Shaw, Milton Farb(deceased), Alex Ford, Annabelle Conroy, Harry Finn and Joe Knox(unofficial). That's the dream team right there!!! The characters were perfect and as the Camel Club stumbled upon the uncharted territories, things started to get complicated and the stakes were pretty damn high. The plot was inter woven perfectly. This was reading The Memory Man - the plot was very intriguing and kept me guessing on WTF was happening. Hell's Corner, David Baldacci's #5 of the Camel Club Series. This was so well written and such interesting character development. I really loved it. Great read. Second Read: I'd forgotton some of the story, so listening to it again was very exciting. There is an attack on the heart at the White House. At a place called Hell's Corner. John Carr a.k.a. Oliver Stone--once the most skilled assassin his country ever had, stands in Lafayette park in front of the White House, perhaps for the last time. Hell's Corner, David Baldacci's #5 of the Camel Club Series. This was so well written and such interesting character development. I really loved it. Great read. Second Read: I'd forgotton some of the story, so listening to it again was very exciting. There is an attack on the heart at the White House. At a place called Hell's Corner. John Carr a.k.a. Oliver Stone--once the most skilled assassin his country ever had, stands in Lafayette park in front of the White House, perhaps for the last time. The president has personally requested that Stone personally requested that Stone serve his country again on a high risk covert mission. Though he's fought for decades to leave his past career behind, Stone has no choice but to say yes. Then Stone's mission changes drastically before it even begins. It's the night of a state dinner honoring the British Prime Minister. As he watches the motorcade leave the White House that evening, a bomb is detonated in Lafayette Park , an apparent terrorist attack against both leaders. It's in the aftermath that Stone takes on a new more urgent assignment, to find those responsible for the bombing. I just loved this book. So much suspense, and excellently written. Ron McGlarty and Olag Cassidy were the narrators. I heard and interview with Baldacci and Ron McGlarty. This book has some exciting twists and turns. McGlarty said as he was reading that he was absolutety stunned at the end, and the surprises were terrific. Highly recommend. Oliver Stone is recruited by the President of the United States to help serve his country on a top secret mission. In exchange for his services, Stone will never have to worry about the government knocking on his door again. The offer is too good for Stone to refuse. Stone is standing outside in Lafayette park, outside of the White House, enjoying his last night before he heads out of the country. High dignitaries are heading to their cars after being wined and dined at a dinner honoring the Bri Oliver Stone is recruited by the President of the United States to help serve his country on a top secret mission. In exchange for his services, Stone will never have to worry about the government knocking on his door again. The offer is too good for Stone to refuse. Stone is standing outside in Lafayette park, outside of the White House, enjoying his last night before he heads out of the country. High dignitaries are heading to their cars after being wined and dined at a dinner honoring the British Prime Minister. Suddenly, everything turns to disaster when a bomb goes off. Stone wakes up in the hospital. Due to the high nature of this threat the FBI, Secret Services, and the Camel Club are all working on solving the case. Although the ending was for the birds, up to the very last few pages this book was prime thriller material and kept me completely engrossed. Amé este libro, esta última entrega de una de las mejores sagas de intriga que leí. Voy a extrañar tanto a Oliver Stone, Caleb Shaw, Milton Farb, Harry Finn, Joe Knox, Annabelle Conroy, Reuben Rhodes y Alex Ford... En este tomo me encontré con un caso complejísimo, que deja totalmente perdidos tanto a los lectores como a los personajes. En donde nada es lo que parece y nadie puede confiar en nadie. Tiene una resolución sorprendente, un final en el que tu corazón va a latir a una velocidad más rápida de la corriente. A very good read and excellent addition to the Camel Club series. "Oliver Stone" is witness to a bomb going off late at night in Lafayette Park - who was behind this explosion, who were the other people in the park and what exactly were they doing there late at night! Lots of action, twists and turns, some red herrings and some surprises. I enjoyed this book and the whole series and highly recommend it to anyone that likes the "spy world"! From the blurb: n attack on the heart of power . . . In si A very good read and excellent addition to the Camel Club series. "Oliver Stone" is witness to a bomb going off late at night in Lafayette Park - who was behind this explosion, who were the other people in the park and what exactly were they doing there late at night! Lots of action, twists and turns, some red herrings and some surprises. I enjoyed this book and the whole series and highly recommend it to anyone that likes the "spy world"! In sight of the White House . . .
At a place known as . . .
John Carr, aka Oliver Stone-once the most skilled assassin his country ever had-stands in Lafayette Park in front of the White House, perhaps for the last time. The president has personally requested that Stone serve his country again on a high-risk, covert mission. Though he's fought for decades to leave his past career behind, Stone has no choice but to say yes. Then Stone's mission changes drastically before it even begins. It's the night of a state dinner honoring the British prime minister. As he watches the prime minister's motorcade leave the White House that evening, a bomb is detonated in Lafayette Park, an apparent terrorist attack against both leaders. It's in the chaotic aftermath that Stone takes on a new, more urgent assignment: find those responsible for the bombing. British MI-6 agent Mary Chapman becomes Stone's partner in the search for the unknown attackers. But their opponents are elusive, capable, and increasingly lethal; worst of all, it seems that the park bombing may just have been the opening salvo in their plan. With nowhere else to turn, Stone enlists the help of the only people he knows he can trust: the Camel Club. Yet that may be a big mistake. In the shadowy worlds of politics and intelligence, there is no one you can really trust. Nothing is really what it seems to be. And Hell's Corner truly lives up to its name. This may be Oliver Stone's and the Camel Club's last stand. Oliver Stone has led so many lives he lost count. For all the losses he has suffered there has been the gain in his friends and cohorts known as the Camel Club. A group of people that are as different they come together and make one large, right group. They solve crimes, take care of each other and never fail to have one another’s back. But this latest case is one Stone has to handle on his own and no one including him is happy about it even though the President of the United States is asking for his help. But before Stone can do his work for the President a bomb goes off across the street from the White House creating the scenario where conclusions are drawn, angles are worked and assumptions made. While everyone is running to the right the masterminds are veering to the left and keeping everyone off balance including all the alphabet agencies in Washington, DC. Stone is drafted back into the service of the government with the promise that all past indiscretions would be erased yet the problem for Stone is that his sins have been of such huge proportion he is not sure this is a statement based in fact. But Stone finds himself partnered with an MI6 agent who is as cunning as he is and keeps up even while running after him. The Camel Club goes from upset at being turned away to forcing its way into the investigation and from that moment on the determination to capture the criminal and figure out what is really going on grows to a proportion even Stone can’t control. But the agency he is now working for is throwing him off with smoke and mirrors, bodies are piling up, misconceptions abound and everyone becomes a suspect. Stone wants the nightmare to stop but for every decision he makes that draws a resolution to the case another one shows up to prove to him the last one was way off base and leads blow away with the wind. Without his group Stone knows he can’t solve this case but in this particular situation is the gain of apprehension worth the answer to who did the deed? This series blows me away every time because the characters have so much depth and they are written with such clarity that you feel they just passed you on the street and said Good Morning. Stone may lead this merry band of misfits but he is not their leader he is a member of a close knit, well thought out group of people that can easily carry any book on their own and have proven that in the past. Mr. Baldacci knows how to write a great story and this one stands out in that it will scare you to realize the fiction he is proposing is probably fact and I hope there is a retired Agent Stone out there protecting us. This is the fifth book in the Camel Club series by David Baldacci. I listened to this on audiobook and, I have to say, it took a bit of concentration due to the complexity of the storyline. A bomb goes off in Lafayette Park - directly across Pennsylvania Avenue from the White House. Because of the location of the park, the jurisdictional challenges are enormous with the Secret Service, Homeland Security, the Park Service and the FBI as well as the DC Police all responsible for different pieces of This is the fifth book in the Camel Club series by David Baldacci. I listened to this on audiobook and, I have to say, it took a bit of concentration due to the complexity of the storyline. A bomb goes off in Lafayette Park - directly across Pennsylvania Avenue from the White House. Because of the location of the park, the jurisdictional challenges are enormous with the Secret Service, Homeland Security, the Park Service and the FBI as well as the DC Police all responsible for different pieces of the park. Stone is brought in by the NIC and the White House to participate in the investigation of the bombing. He is teamed up with Mary Chapman, an agent from MI6 that is brought in to assist the investigation when it appears the British PM may have been the target. As Stone is working the case, it seems that the investigators are being watched by others within their own government as well as the bad guys - who always seem to be one step ahead of them. Distrustful of the other agencies, Oliver turns to the people he can count on - The Camel Club. As they investigate the possibility of involvement by Mexican Drug Cartels, Russian Mafia, and International Terrorists - all while navigating the dangerous political waters of DC - Oliver and his friends become targets and find their lives at risk. Will this be their last mystery? This audiobook was read by Ron McLarty and Orlagh Cassidy - both of whom did a great job bringing the characters to life and keeping the listener interested. Washington is Babylon! You can't trust anyone, taking a life is just an ordinary every day occurrence. For Oliver Stone, the people of Washington (politics) are truly evil. Hell's Corner takes you through the woods to grandma's house, past Jack the Ripper, dine with Hannibal Lecter, vacation with Jeffrey Dahmer and sleep with Ted Buddy. No one is whom they appear to be. Everyone has their own agenda and all the federal agencies are not sharing what they know amongst each other. Oliver Stone has Washington is Babylon! You can't trust anyone, taking a life is just an ordinary every day occurrence. For Oliver Stone, the people of Washington (politics) are truly evil. Hell's Corner takes you through the woods to grandma's house, past Jack the Ripper, dine with Hannibal Lecter, vacation with Jeffrey Dahmer and sleep with Ted Buddy. No one is whom they appear to be. Everyone has their own agenda and all the federal agencies are not sharing what they know amongst each other. Oliver Stone has been summoned by the President of the United States to perform a mission on Russian soil. In return he will be pardoned and cleared of all wrongdoings if he survives the mission. Things change after a bomb explodes right in front of the White House, in Lafayette Park. Now Stone has been teamed up with Mary Chapman, an MI-5 agent, to resolve the bombing. Each time they get a lead, it ends in someone getting severely injured or murdered, leaning more toward the latter. Oliver knows that they, the powers that be, are out to get him and so he goes to whom he can trust; the Camel Club. Another in the Camel Club series that are now typical Baldacci. His first books, "Absolute Power" & "Total Control" were great books. Later books, such as "The Winner", "Saving Faith" and "Wish You Well" were very good. With this read, I have read all 20 Baldacci novels. Like many other authors of today, a once good writer has turned into a book mill. Baldacci has become more Patterson-like with each book producing formula reads instead of stories. Hell's Corner is set in Washington and cente Another in the Camel Club series that are now typical Baldacci. His first books, "Absolute Power" & "Total Control" were great books. Later books, such as "The Winner", "Saving Faith" and "Wish You Well" were very good. Hell's Corner is set in Washington and centered around "Oliver Stone" and the Camel Club. In this adventure of the Club, most other members are bystanders and Oliver grandstands the plot for himself. Like the all of the more recent Baldacci novels and none of the early Baldacci novels, Hell's Corner is nothing but a page turner. It holds your interest, but when you are done, what story have you read? The same story you read every other Baldacci book of the last 5 years. Do you care that you read it? No! Why read it? It beats the hell out of TV. Will I buy the next Baldacci? Maybe. In area of DC called Hell's Corner, Oliver Stone aka John Carr takes in the sights for what he believes will be his last time. The President has asked Carr/Stone to take on a mission of national importance, one that he is uniquely qualified to do as he was once this countries top assassins. He agrees without reservation. Something he agreed to at the end of Divine Justice as way way of his own penance, as it were. What comes next is a rollercoaster ride that will leave your head spinning. Key players may or may not be who you think they are, and someone has his target set on Carr/Stone for permanent removal, while at the same time, forces in our own government are working with outside sources to take down the US president. First, as Carr/Stone is watching the British PM's motorcade leave the White House that evening, a bomb is detonated inside Lafayette Park, an apparent terrorist attack against the PM himself. Carr/Stone is knocked unconscious. When he is finally released, he lead to the White House where President tells him things have changed. Carr/Stone was supposed to be going to training for a month, before flying to Mexico to take on the drug cartel, which someone believes involves the Russians. Enter British MI-6 operative Marry Chapman as Carr/Stone's partner in investigating the bombing attempt on the PM. Chapman is a protegee of a man Carr saved back in 1977, James McElroy, and who has his own agenda that twists and turns throughout this story. Chapman, isn't who you think she is either, and that become clear at the very end of the book, but she does find a way to save Carr/Stone's life as the only person he believes he can trust. Carr/Stone is given a badge and is sworn in as an official agent. Things we learn. Abby Riker, Carr/Stones former love interest is no longer in the picture. Carter Gray and Roger Simpson are dead at Stone's own hands. A new NIC director Riley Weaver, also has a few secrets of his own, and doesn't really care for Stone/Carr, and makes sure to throw several roadblocks in his way, and worse, leave out important information that could have solved the puzzle much sooner. The usual suspects in the Camel Club are back: Annabelle Conroy, the unofficial member of the Camel Club and a con artis by trade; Caleb Shaw, who works for the Library of Congress; Harry Finn, who once held a huge grudge against Stone/Carr after he killed his father, and Alex Ford, the US Secret Service agent that has saved Stone's live more than once, and is a key player in saving the presidents life later in the story at the peril of his own life. As you remember, Milton Farb, died in Divine Justice and because of that Stone/Carr has decided NOT to allow any member of the Camel Club to be hurt on his account ever again. As things become clearer in the investigation, more key players are killed including FBI Special Agent Tom Gross. Another player in the game, is someone Stone/Carr knew named Adelphia. It seems she too, is not who she portrayed herself to be. The plot thickens when it is discovered that Nanotechnology developed by the Mexican Cartel under Carlos Montoya has found a way to bypass drug dogs, thereby making them invisible to detection. Joe Know, another player in the Camel Club series, comes to Stone/Carr's rescue towards the very end when it has become apparent that Stone/Carr can't trust anyone, not even his own partner. It also happens that after trying to avoid hurting his friends, he finally breaks down to Annabelle request and allows the Camel Club into the investigation. Stone/Carr realizes that they've helped him more than he realizes and yes, he does need them around. Villian(s) of the story: Marisa Friedman, CIA Operative who took a billion dollars from Montoya to bring down the adminstration and blame the Russians. Riley Weaver, Director NIC. He knows all about Carr/Stone's history, and it appears he will try anyting to bring the man down. Carlos Montoya, of course. He was believed to have been killed, or deemed a non threat, but he still remains a powerful force in the Mexican drug cartel. I must say that Oliver Stone/John Carr is one of my favorite characters. Yes, he makes mistakes, but he manages to swim his way through the crocodiles as the end, and come out as a winner. There has been plenty of people trying to take him down, and he is still standing along with his Camel Club friends. This book moves along at a pretty brisk pace and of course, the mystery of who actually is the killer, was not realized until nearly the end of the story. One of the better books that Mr Baldacci has recently released. Well, a big disappointment. I loved the first 3 in the Camel Club series, and I love the Oliver Stone / John Carr character, but this one was a big letdown. It just didn't feel like the author's heart was in it. Loose ends coming together in ways so implausible it made me want to stop several times. The "cliche" factor was incredibly high in this one, to the point where it was impossible to really identify with any of the characters. I need characters that are plausible and believable enough to Well, a big disappointment. I loved the first 3 in the Camel Club series, and I love the Oliver Stone / John Carr character, but this one was a big letdown. It just didn't feel like the author's heart was in it. Loose ends coming together in ways so implausible it made me want to stop several times. The "cliche" factor was incredibly high in this one, to the point where it was impossible to really identify with any of the characters. I need characters that are plausible and believable enough to identify with, and when they start straying too far from the nature of folks in our culture, I can no longer identify with them. This is the first book I've deliberately abandoned. The dialogue is absolutely atrocious! The author uses one of the characters to tell us what is happening, which makes the dialogue unnatural and boring. The characters also sound like archetypes rather than natural characters, and its all because of the dialogue. Add that the plot is impossible to believe and the author has no idea how to build suspense. I'm in the middle of this one. The Camel Club is my favorite of David Baldacci's series because of its misfit crew led by a homeless vet who lives in a cemetery a little north of Georgetown. It is also propitious as I have been working a 1/2 block from Hell's Corner which is actually Lafayette Park across from the white house. Lately I have been thinking that Baldacci should add a DC contract attorney to his ragtag group of ragamuffins. During periods between jobs I have worked as a contract att I'm in the middle of this one. The Camel Club is my favorite of David Baldacci's series because of its misfit crew led by a homeless vet who lives in a cemetery a little north of Georgetown. It is also propitious as I have been working a 1/2 block from Hell's Corner which is actually Lafayette Park across from the white house. Lately I have been thinking that Baldacci should add a DC contract attorney to his ragtag group of ragamuffins. During periods between jobs I have worked as a contract attorney. Nonglamorous but necessary work in the electronic discovery field. During my time I have met some incredibly interesting attorneys, some of them down on their luck, some just starting out and paying off their student loans before taking on a job in the public interest sector, some funding interim human rights law careers by temping for a few months and then doing human rights work for a few months. I have also met attorneys in the document review fields with Ph.D.s in Law from Oxford, bilingual, trilingual, pentalingual and even some sexolingual and polyglot attorneys, as well as and some legal heroes who risked (and lost) their careers by being whistleblowers. Just the kind of unseen and unrecognized heroes that would fit right into the Camel Club. And of course it's fun to read a book and think, "Hey! I walk there for lunch!" Though Baldacci hasn't mentioned the homeless and unemployed men who stand outside the Martin Luther King Library before noon on Mondays and 9:00 am other days to read, look for jobs on the internet and just get out of the rain. I am reading the Large Print edition because the DC Public Library hasn't put this 2010 book on its circulation list yet. A 5-star rating for a book writen by an author whose name is genrally larger than the title on teh dust cover? Yeah, I was shocked too! I am a big fan of David Baldacci and regularly give his books 4-star ratings. But 5? This one was, for me, a hit out of the ball park! Up to this point, I've only read the first book in Baldacci's Camel Club series and if I remember correctly I was particularly overwhelmed by it. The plot of Hell's Corner intrigued me enough to ignore the fact I was going to enc A 5-star rating for a book writen by an author whose name is genrally larger than the title on teh dust cover? Yeah, I was shocked too! I am a big fan of David Baldacci and regularly give his books 4-star ratings. But 5? This one was, for me, a hit out of the ball park! Up to this point, I've only read the first book in Baldacci's Camel Club series and if I remember correctly I was particularly overwhelmed by it. The plot of Hell's Corner intrigued me enough to ignore the fact I was going to encounter unfamiliar character and background info. I was desperate for a good book to read (as everything else4 I'd tried wa putting me to sleep); so I just jumped into this 5th book in Baldacci's Cammel Club series. All I can say is WOW and I'll be going back and reading books 2-4 ASAP. If you're a fan of well-written political thrillers, I highly recommend this book. It's fast paced, full of plot twists and turns and enough red herrings to keep you (and the characters) guessing. I could not put this book down! Hell's Corner was for me, more than just a really good book, it was amazing!! Bombings, assassinations, and espionage - oh my! Oliver Stone (aka - John Carr), an aging ex-special operative of a defunct group once know as the 'Triple-six', is called-up to serve his country once more. This time he is being beckoned by the president himself and his mission... well, he never actually gets to his mission, so that really doesn't matter. Another crisis takes precedent, a bombing and automatic rounds being fired in Lafayette Park across from the White House. His Camel Club pals (r Bombings, assassinations, and espionage - oh my! I have never read a David Baldacci novel and was not disappointed. I definitely need to read more of the Camel Club novels. Oliver Stone (aka John Carr), lives simply, as a caretaker of a cemetery, but is called back to duty with the government when a bomb goes off in Lafayette Park in Washington DC (Hell's Corner). British agent, Mary Chapman, becomes his partner and the members of the Camel Club join the team. Intriguing story of political mischief where the government agencies don't communicate I have never read a David Baldacci novel and was not disappointed. I definitely need to read more of the Camel Club novels. CAMEL CLUB #5... GOTTA LOVE STONE! CAN’T GET ENOUGH OF HIM! CAN’T GET ENOUGH OF THIS SERIES! Start with the first book. This series is dynamite! When Oliver Stone (John Carr) is summoned before the US president for a mission involving Mexican drug trafficking he has no idea that mission is about to be derailed by a bomb exploding in Lafayette Park, right in front of the White House at the same time the British Prime Minister was scheduled to be walking through it. The chase is on and Oliver must team up with new associates as well as the familiar Camel Club members in a high stakes game of cat and mouse. The final Camel Club novel (at le When Oliver Stone (John Carr) is summoned before the US president for a mission involving Mexican drug trafficking he has no idea that mission is about to be derailed by a bomb exploding in Lafayette Park, right in front of the White House at the same time the British Prime Minister was scheduled to be walking through it. The chase is on and Oliver must team up with new associates as well as the familiar Camel Club members in a high stakes game of cat and mouse. The final Camel Club novel (at least as of this writing) is another fine example of David Baldacci’s absorbing writing. One of the things I like about this series is that each novel introduces a new major character who has the potential to become a new member of the Camel Club. Their career also changes the “type” of novel that results too. We’ve had straight thrillers, FBI chases, CIA intrigue, and my favorite one involving the complex long-con game pulled off by Annabelle. This time around we have a British MI-6 agent named Mary Chapman who teams up with Oliver in what amounts to a detective story (albeit one with lots of violence and an anti-terrorism plot) where the bad guys are always one step ahead. I’ll keep reading Baldacci as long as he keeps writing these sorts of fun, page-turning stories that tend to keep me up past my bedtime..
Baldacci has written so many terrific books that one might think he couldn't come up with something novel and interesting. NOT SO! The Camel Club series and the Oliver Stone character do not know how to be dull or boring. Action packed, and with twists and turns, and never knowing what might happen next, the book keeps the reader's interest to the very last page. While Hell's Corner is not a brand new book, I had not read it, so being a fan of Baldacci, I did not hesitate to jump in and start rea Baldacci has written so many terrific books that one might think he couldn't come up with something novel and interesting. NOT SO! The Camel Club series and the Oliver Stone character do not know how to be dull or boring. Action packed, and with twists and turns, and never knowing what might happen next, the book keeps the reader's interest to the very last page. 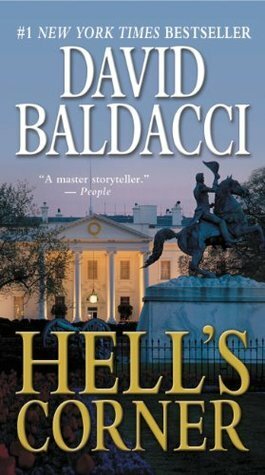 While Hell's Corner is not a brand new book, I had not read it, so being a fan of Baldacci, I did not hesitate to jump in and start reading. Noting that the D.C. Metropolitan Area and Lafayette Park would be the scene of much of the action, I was particularly interested. I am familiar with the area and geography and was even more anxious to follow the story in that area. Baldacci fans who have not read this one, will want to do so. Hell's Corner is easily the best book in the Camel Club series. It has a great plot involving intrigue and espionage along with an excellent villain. Like other books by Baldacci, this is fast paced and easy to read. It has a great set of returning characters plus new ones, as with every installment in this series. Great read. Honors the Camel Club.I hungry for more. What more can I say. Thank you very much. What a great book, and a great series! This is the last book in the Camel Club series to date, but it can't end here, Baldacci needs to keep this series going! A great final edition in this series! Back in the game, Oliver Stone met his greatest adversary yet! I have loved this series from David Baldacci! David Baldacci has been writing since childhood, when his mother gave him a lined notebook in which to write down his stories. (Much later, when David thanked her for being the spark that ignited his writing career, she revealed that she’d given him the notebook to keep him quiet, "because every mom needs a break now and then.”) He published his first novel, Absolute Power, in 1996; it was subsequ David Baldacci has been writing since childhood, when his mother gave him a lined notebook in which to write down his stories. (Much later, when David thanked her for being the spark that ignited his writing career, she revealed that she’d given him the notebook to keep him quiet, "because every mom needs a break now and then.”) He published his first novel, Absolute Power, in 1996; it was subsequently adapted for film, with Clint Eastwood as its director and star. In total, David has published 36 novels for adults; all have been national and international bestsellers, and several have been adapted for film and television. His novels have been translated into more than 45 languages and sold in more than 80 countries, with over 130 million worldwide sales. David has also published six novels for younger readers. A lifelong Virginian, David graduated from Virginia Commonwealth University and the University of Virginia School of Law, after which he practiced law in Washington, D.C.
David and his wife, Michelle, are the co-founders of the Wish You Well Foundation®, which supports family and adult literacy in the United States. In 2008 the Foundation partnered with Feeding America to launch Feeding Body & Mind, a program to address the connection between literacy, poverty and hunger. Through Feeding Body & Mind, more than 1 million new and used books have been collected and distributed through food banks to families in need.